Although I have been working exceptionally hard on getting some pieces finished this fall, I did get up to New York for two musical events – an opera whose composer speaks of his work as “symphonic”, and a symphony that is set in motion by atmospheric melodic lines. There is much beautiful music in Thomas Adès’s operatic version of Shakespeare’s The Tempest, but I was only intermittently moved by the piece, more impressed than touched. Harmony comes to the fore here rather than melody. Anthony Tommasini wrote in the Times of how “every word of the libretto is supported or enshrouded by a chord somewhere in the orchestra, so that almost every vocal line becomes a mysterious chorale.” Adès’s music is part of the continuing story of tonality as he finds fresh ways to use tonal materials and fresh contexts for familiar musical objects, though those elements are usually masked to a greater or lesser degree. The mysterious quality Tommasini mentions means that this is a musical language well suited to the fantastical qualities of the opera’s subject. The great weakness of the piece, as some reviewers have noted, is the libretto, in which all of the poetry seems to have been carefully squeezed out of Shakespeare, leaving behind only husks in the form of short-limbed and gracelessly rhymed couplets. Adès mostly overcomes the shortness of these lines, but they remain distractingly plain and abrupt. The singing was very fine throughout, with Simon Keenlyside’s powerful Prospero and Audrey Luna’s Ariel most striking. Everyone comments on the insanely high tessitura of Ariel, and while Luna tosses off the high stuff dazzlingly well, what is more striking is the musicality with which she does so, and the way she inhabits the part with acrobatic freedom – musically and physically. Her off-stage phrases help make the closing pages of the piece quite haunting. I think the conceit of placing the production in an imaginary opera house was too explicit and called attention to itself. Some of the same stage images could have been used effectively without the framing device of an opera house being so emphatically present. Steven Stucky’s new symphony as performed by the New York Philharmonic was the other piece that brought me to NYC this fall. I think the piece succeeds in filling the big shoes implied by the title. That title shouldn’t be such a big deal. John Adams’s large scale, multi-movement orchestral pieces like Naive and Sentimental Music are symphonies in all but name, yet by avoiding the name “Symphony” he avoids discussion of the work’s relationship with the genre. But there it is, Stucky chose to go with the name, with its connections to the great tradition and its suggestions of something with weight and import. Though his program note spoke of four sections, including a scherzo-like portion, the piece plays continuously, and the divisions between the sections are not 100% clear-cut. Perhaps the continuous nature of the piece, with its gradual movement through musical landscapes, recalls the Sibelius Seventh. The bigger statements of Copland are sometimes referred to as utilizing his “public” voice, the Third Symphony being the most obvious example of this. There are traces in Stucky’s new piece of the “public” manner of his big LBJ oratorio (which, happily, was recently nominated for a Grammy) – a certain breadth to the gestures. There are moments here where the emotional stakes are quite high. But there is an intimate aspect to the symphony as well, right from the start with its evocative wind solos. The other difference between the oratorio and this piece is the harmonic idiom, which is rather darker in the new work. Indeed, the harmony here is exceptionally personal, with little of the hints of Lutoslawski’s idiom that sometimes appear in Stucky’s work. The closing pages of the work, with returning melodic shapes heard through a scrim of pure triads in the strings, are moving – I would have appreciated even more of this. The Philharmonic sounded brilliant and committed. Here’s a picture of Steve and I after the performance. 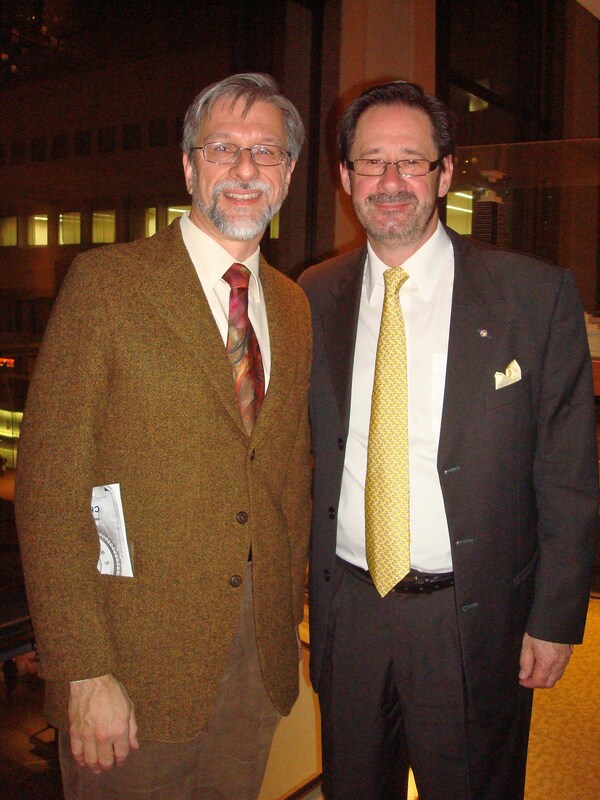 Sometimes people say the two of us look somewhat alike; in fact a lady came up to me after the performance to congratulate me on my symphony – this when Steve was standing a few feet away! Well, for the record, I’m the one in the picture with the gray hair, and the elegantly accessorized outfit, by which I mean the program book awkwardly sticking out of my jacket pocket. It’s always good to read your critiques, Jim. As a singer, I found Ades’ vocal writing to be incredibly annoying. Most of the time, I felt that the displacements in the vocal lines kept the poor singers from being able to express anything at all besides their discomfort in trying to get all the notes. And, as you pointed out, the text they were expressing was execrable, so that one wondered how Ades could possibly have been inspired to do any better. The opera had it’s instrumental and harmonic beauties, but that alone does not make for great opera. I’d much rather be singing your lines!